How Do I Clean Mold On Vinyl Flooring? 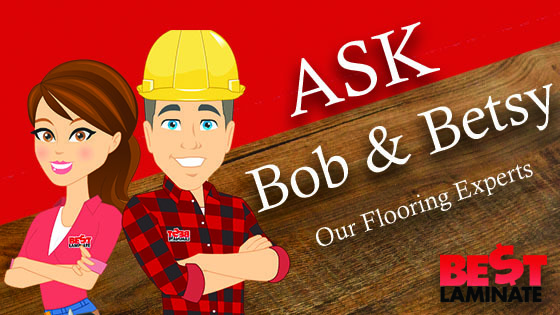 Home >> Ask Bob & Betsy Series >> How Do I Clean Mold On Vinyl Flooring? Our french doors have been leaking. I noticed this dark stain under the vinyl floor. I’m thinking it’s mold. How do I clean mold on vinyl flooring and will I have to replace the flooring? Yikes! Mold is never a word you want to see in your home. While mold in your home is not always a death sentence, you should be cautious when dealing with mold on vinyl flooring or any flooring. In order to find out what type of mold you are dealing with, you should really get the mold tested. This can be done either by purchasing an mold kit from the store, or calling in a professional. Some mold can be simply cleaned with a bleach and water mixture, but other molds need to be cut out and the home’s air scrubbed. Know what you’re dealing with before you start trying to clean up. Although vinyl floors are resistant to moisture, mold and mildew can grow if there is standing water around the edges, grooves or under the floor. If you notice standing water, it is important to fix the cause of the standing water before trying to repair or clean your floors. If your kit comes back with a harmless, common mold, you can simply clean it up with a bleach and water mixture. Allow the area to air dry completely with the use of fans or an air purifier. Clean off the affected vinyl flooring in the same manner, allow to dry, and then reinstall. 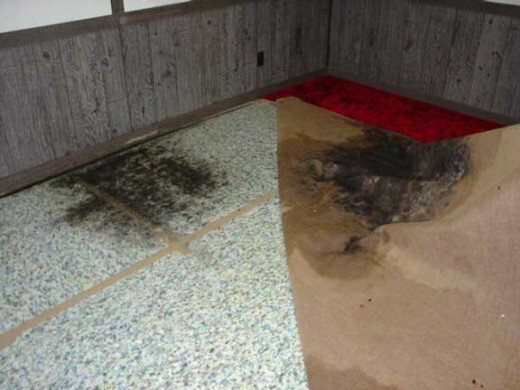 However, it is a more harmful mold such as black mold, simply using bleach WILL NOT kill it. These molds can appear to be killed by using a bleach and water mixture. However, the only true way to get rid of mold is to cut it out. Before anything, you must stop the leak. Fix this first or there will be more issues with mold and damage in the future. You then must rip out whatever has mold on it and replace it. Dangerous mold can and will cause sicknesses, including vomiting, nausea, and breathing related problems. Dont’ take any chances on your health. Cutting out the mold in the sub-floor and replacing the flooring is the best way to completely remove the mold from your home. You should then rent an air scrubber for the room to remove any mold spores. Retest the room or home to make sure you have removed all of the mold. If you have any more questions or concerns, you should leave a comment below and we will help in any way we can! Can vinyl flooring be used outside? Can Vinyl be Used in Commercial Applications? Hi, I am a flooring contractor & recently inspected a kitchen with a Mannington seamless vinyl floor installed about 9 months ago. Grey spots about the size of a quarter appeared on the top of the vinyl. Upon further inspection there were more grey markings that seemed to follow the patterns of the ceramic tile under the new floor. I tried cleaning the markings with acetone and other cleaners at my disposal that are used in the flooring industry, nothing worked, the spots were under the wear layer. I lifted a section of the floor some of the spots matched the pattern of the ceramic tile under the floor. The floor is a tape down installation. I scrubbed those grey spots with a white cloth and the stains wouldn’t budge. The Mannington rep said it must be mold. Could they be from mold! Hi John, thanks for reaching out. It is hard to say without seeing it, but if there was moisture between the ceramic tile and vinyl, it is possible. I would recommend having a representative from Mannington or a professional inspector come out to determine what it may be. My sink in the basement overflowed on to the ground I just install life proof vinyl flooring and water got underneath it and when i walk on it water seeps up from the cracks. will it dry eventually and will mold grow underneath my flooring? Hey Brian. This is one of those issues I would definitely recommend going right to the manufacturer for any questions such as that. In most cases though the flooring needs to be removed and the subfloor dried off completely before putting the floor back down. So like a lot of people have said already “they have mold under their vinyl or linoleum ” I to have this problem. Put laminate click lock planks. Hey Tracy, thank you for reaching out. Unfortunately I am not sure on if that would be the proper way to clean up mold. Sorry for the inconvenience. The stain i believe is mold directly in front of my shower, seems to be coming from under the linoleum, cleaning the surface does nothing. This is a rental, so i cant just pull up the floor to clean under it. any suggestions? Hi Chris, if this is a rental property, we could recommend contacting your landlord to fix the mold issues coming from the subfloor. Mold can be dangerous to your health, and it would be best to fix the moisture issue before it gets worse. If the mold is coming below the flooring, you will need to remove the linoleum and fix the mold on the subfloor.